My heart beat a little quicker as I approached the castle. I hadn’t visited Casa Loma in Toronto since I was a child and, truth be told, I was a little nervous that it wouldn’t live up to the memory. It had been the grandest place that I had ever visited; its Great Hall loomed large in mind. What if perspective had governed my remembrance? I was a lot smaller when I was a child. As we turned the corner, the Gothic-Revival house appeared…as monumental as I had recalled. Its crenellated towers tickled my fancy, just as they had done in childhood. Although three decades had passed, I still wanted to race to the top of one and survey the land. Located atop a high elevation in midtown, Casa Loma dominates contemporary, urban Toronto. Its medieval flair is both out of place and well-suited to the city’s Bohemian feel. Having a 64,700 square foot private residence with expansive grounds situated not more than a kilometer from a Tim Horton’s restaurant (Canada’s famed fast-food chain) somehow does not seem abnormal. Toronto’s “Camelot” dazzles with 98 rooms filled with treasures. Former owner Sir Henry Pellatt came from an affluent family. European travels inspired his love of art and architecture and, undoubtedly, influenced the design of his abode. After being made partner in his family’s stock-brokerage business, Sir Henry made a fortune by investing in electric lighting, hydro-electric projects at Niagara Falls, railroads, and other ventures. With $17 million dollars to his name, Sir Henry engaged Toronto architect Edward Lennox to design a mansion befitting his knighthood. Lennox, known for his Richardsonian Romanesque structures, was eminently up to the task. Construction of Casa Loma started in 1911; it took $3.5 million and three years to complete the grand home. Sir Henry and his wife, Lady Mary, had an impressive place to entertain visiting dignitaries and for Lady Mary to conduct her charitable activities (especially as patron of the Girl Guides of Canada). Financial misfortune befell Sir Pellatt though and soon “Camelot” crumbled. He lost his near monopoly on electric power. Moreover, the Great War hurt the economy and meant that Canadians weren’t rushing to develop the land that Pellatt speculated on. Building Casa Loma had put him into serious debt and his company was also in severe financial trouble. The Pellatts left their home in 1924. Everyone can now enjoy Casa Loma. Toronto took over ownership of the estate and runs it as one of their biggest tourist attractions. On a warm August day, I reentered Casa Loma. I hadn’t been there in over two decades. It welcomed me back with an enchanting symphony on the terrace. Okay, the symphony probably wasn’t for me…it was likely for the well-dressed women and men who looked like they might be patrons of the arts. Regardless of that fact, I was able to enjoy the music while surveying the gardens. Today, visitors can explore four levels of rooms and treasures, plus well-manicured gardens and stately outbuildings. The Great Hall was as impressive as I remembered with flags soaring overhead from the ceiling. The library, conservatory, and dining room delighted me, while my husband took special interest in the Billiard Room. If Casa Loma charged for a game, I’m sure they could make a tidy sum. We took a secret passageway (although it was labeled so I guess it’s not much of a secret) down to the lower level. Secret or not, I still found the narrow staircase as thrilling as I had as a child. It opened onto a wine cellar (definitely more interesting as an adult). A gallery off of the wine room showcases movie posters highlighting all the movies filmed at Casa Loma. Toronto is a popular city to film American movies and television shows. An 800-foot tunnel connects to former stables, garage, and potting shed. The walk was worth it to see the antique car exhibit in the carriage room. Along the tunnel were placards discussing Toronto’s alcohol prohibition and bootlegging past. Both Canadians and Americans, it seems, continued drinking long after their government told them to stop. Ascending back to the first floor of the main house, we used the not-so-secret passageway to reach the palatial bedrooms of Lady and Sir Pellatt. The third floor offered an interesting view of military history, as well as a peek at how the servants lived. 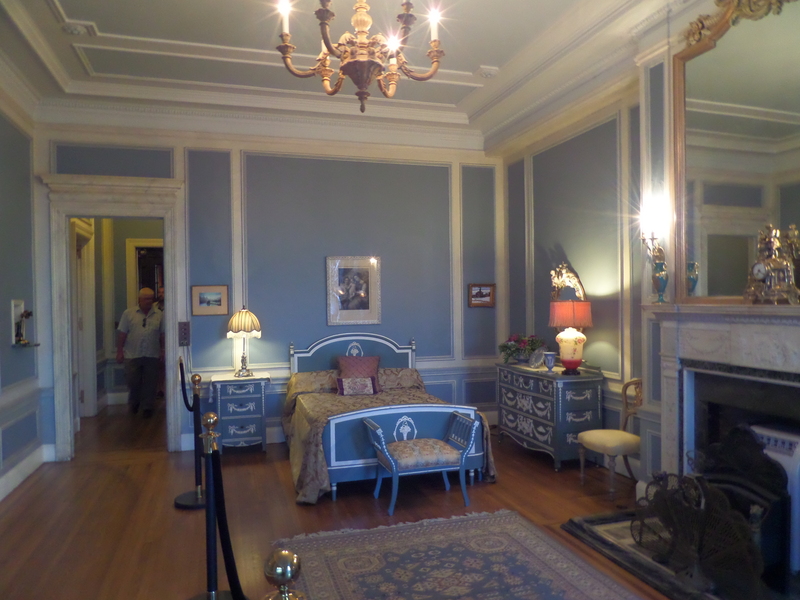 The servant’s room was a stark contrast to the sumptuous suite of rooms for the lady and lord. Lady Mary’s closet was bigger than the servant’s room. I delighted in (and almost expired from) climbing the circular staircase to the top of a tower. Although the small room was decidedly warm on that August day, the view from its windows was unparalleled. Music from the symphony below tinkled through the air. The experience was, in a word, perfect. 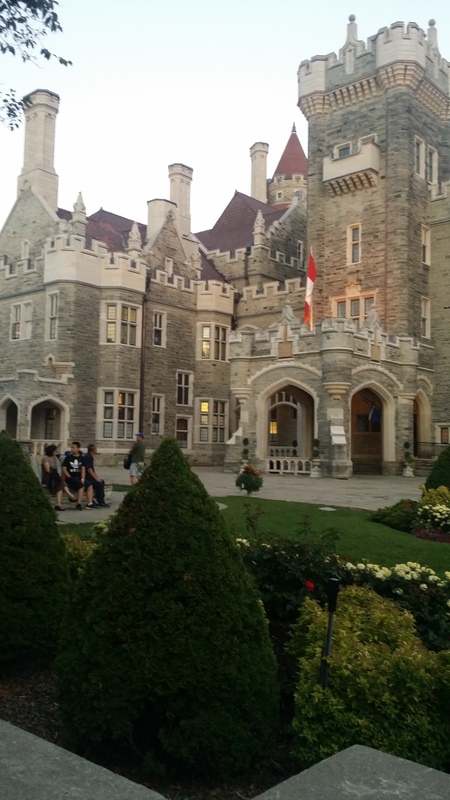 Casa Loma Toronto charmed me once again—some things are as good as we remember them. Tip: There can be quite a line for Casa Loma tickets. We had good luck by going on the night of the week when the castle stays open late. Below are photos of a few of the castle’s rooms. I highly recommend that you personally visit Casa Loma. Toronto has a lot to offer and this gem is just one of them.